Welcome to Access Without Borders. We are a US 501 (c) 3 organization created to partner with organizations in developing countries to invest in sustainable projects that foster personal and economic empowerment for people, organizations, and communities. Please browse our three current projects, all based in Ghana. We have selected each because of their potential to make a real change in the lives of people and communities. CATHOLIC ORTHOPEDIC TRAINING CENTER AND BROTHER TARCISIUS PROSTHETICS COLLEGE. In 1961, Brother Tarcisius de Ruyter founded the Catholic Orthopedic Training Center that, he directed along with Sister Elizabeth Newman, until his death in 2013. The Brother lived just long enough to see the construction of the Orthopedic Training College that is now named in his honor. The College is working towards accreditation from the International Society for Prosthetics and Orthotics and is the first of its kind in English speaking Western Sub Saharan Africa. 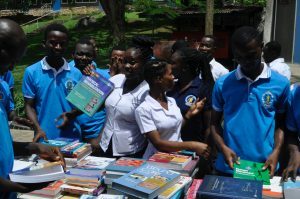 It currently has a three year diploma program wherein students go to school at the Nsawam campus. 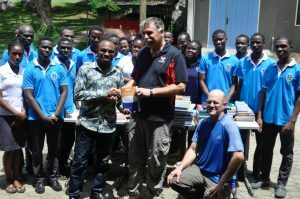 In 2016, Mr. Henry Larbi, acting principal of the College, contacted faculty at Eastern Washington University in the US and Dr. Nick Jackson and Dr. Romel W. Mackelprang are consulting with the College to develop technology based curriculum delivery increase education access to prosthetics education for students and providers in Ghana and other English speaking West African countries. Contributions are urgently needed for student scholarships to attend the College. In addition, dedicated donations to provide technology infrastructure for e-based learning will broaden education access and expand the population of students who can attend the College. New textbooks for the prosthetics college. Bernice Frimpong Ankrah and her husband Prince Ankrah founded Days for Girls (DFG) in Ghana. The Ankrahs and partners provide reusable feminine hygiene kits that last for three years to school aged girls in Ghana, focusing on poor and rural areas. Access to feminine hygiene dramatically increases girls’ school attendance, reduces dropout rates, and help break the cycle of illiteracy and poverty for girls and women in Ghana. DFG also trains local women to make the products for their villages, thus providing an income for them. Kits cost $10 each but are provided free of charge to girls in villages who are also educated about menstruation, reproduction, and preventing pregnancy. Your $10 donation goes toward providing 3 years of schooling for a young woman in Ghana. $100 helps ten girls stay in school for a combined total of 30 years. 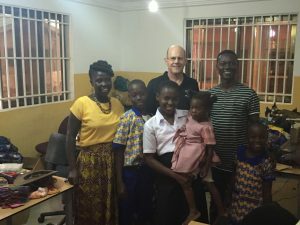 DFG also provides opportunities for students and people to contribute their time by working with DFG in Ghana for short periods of time. This video provides a glimpse into Days for Girls. Otoase’s only water source is a collection basin that is a 15-40 minute walk from people’s homes. The village’s children spend up to 4 hours a day gathering water that can significantly affect their school attendance. And, during the dry season, the village’s water supply can become inadequate. Louisa, in conjunction with other village elders have implemented a plan to provide water access and water security for Otoase. 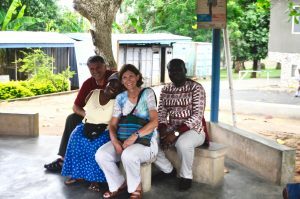 Romel Mackelprang, Louisa Anyinam, Susan Mackelprang, and Henry Larbi at OTC Ghana. This concrete container is about 8’x12’x 8′ deep, collects rainwater from nearby hills. During the dry season, the water supply is seriously diminished and water must be rationed. At the picture top is the conduit that brings water to the container from the underground spring. The lower right hand corner shows the drain pipe that empties excess water when it is plentiful. Under the soil on the left side of this photo is an additional storage tank that has been filled in. Access Without Borders has provided the funds to excavate and refurbish the additional tank. Having two tanks will allow the village to routinely clean the storage tanks, thus reducing the risk of water borne diseases. The Otoase water project will will provide water access tot he village by tripling storage capacity and piping it to the village. The total cost of the project is about $12,000 US. 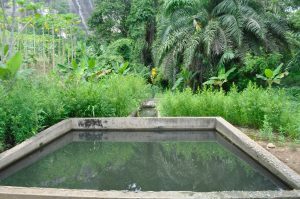 The village has purchased a pump to pump the water to the village and Access Without Borders has provided funding to excavate the buried tank. 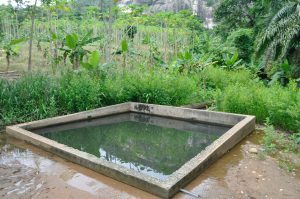 Construct a platform and install a large plastic storage tank in the village. Purchase the construction materials and build the system to pipe the water from the well to the village. Refurbish and construct 4 foot walls on the current tanks; thus tripling water capacity. Leverage funds with local authorities and power company to install power to the project.